Description: Large round 2" deep aqua cooking pot with 2 handles, one on each side (no design on handles). The bottom of the pot has 4 small short "legs" on 4 sides. The inside bottom of the pot is marked "Fisher-Price®" twice. Measures 2" tall x 6-3/16" long (handle to handle) x 5" wide. Description: Large round 2" deep black cooking pot with 2 handles, one on each side (no design on handles). The bottom of the pot has 4 small short "legs" on 4 sides. The inside bottom of the pot is marked with a Fisher-Price logo (twice). Measures 2" tall x 6-3/16" long (handle to handle) x 5" wide. 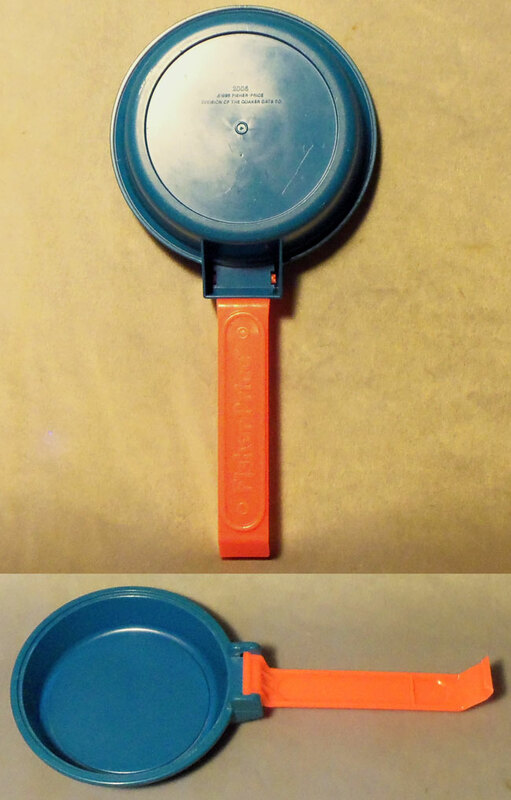 Description: Round blue frying pan with a handle on the side. The handle wider at the end than the top. The end of the handle is squared. The frying pan is about 1 to 1-1/4 inches deep. Description: Round blue frying pan with an oval-shaped handle. The handle has a raised oval-shaped edge on the sides with a raised "Fisher-Price" imprint in the center. Has a hole near end of handle. Measures 3-7/8" diameter, 1-1/8" deep, 2-7/8" long handle. Description: Round blue frying pan with an aqua-green handle on the side. The end of the handle has a small raised oval-shaped imprint with a "Fisher-Price" imprint in the center. Description: Round shallow blue plate/pan with a red handle on one side (to use as a frying pan). The handle has a curved end with a latch edge. Top of the handle is marked, "Fisher-Price". The handle is hinged to fold over the top of the pan (to store together with the FPT7355 plate). 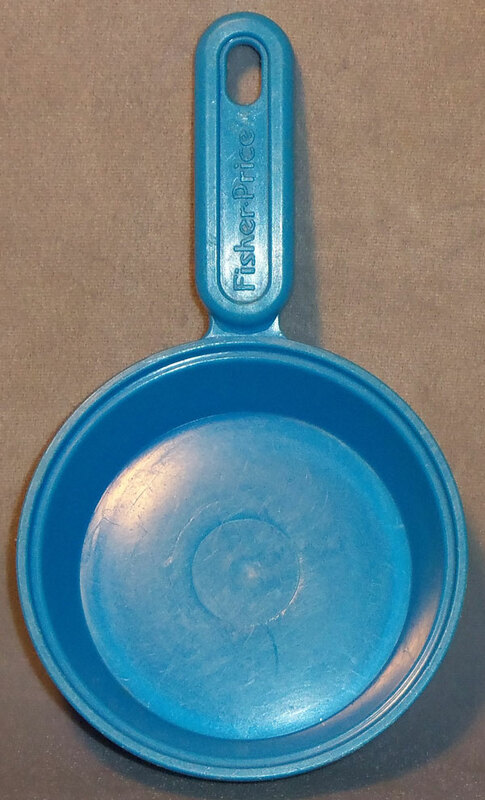 Description: Large blue pan with a handle on the side. The handle has a large odd-shaped hole in the center. 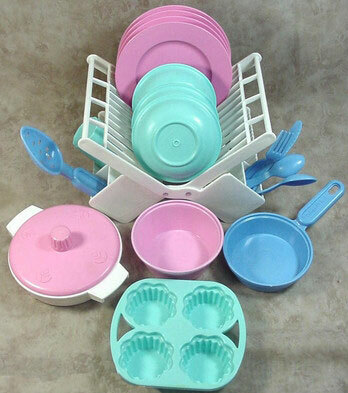 The pan has raised molded textured dots on the inside bottom, and raised molded textured rings on the outside bottom. 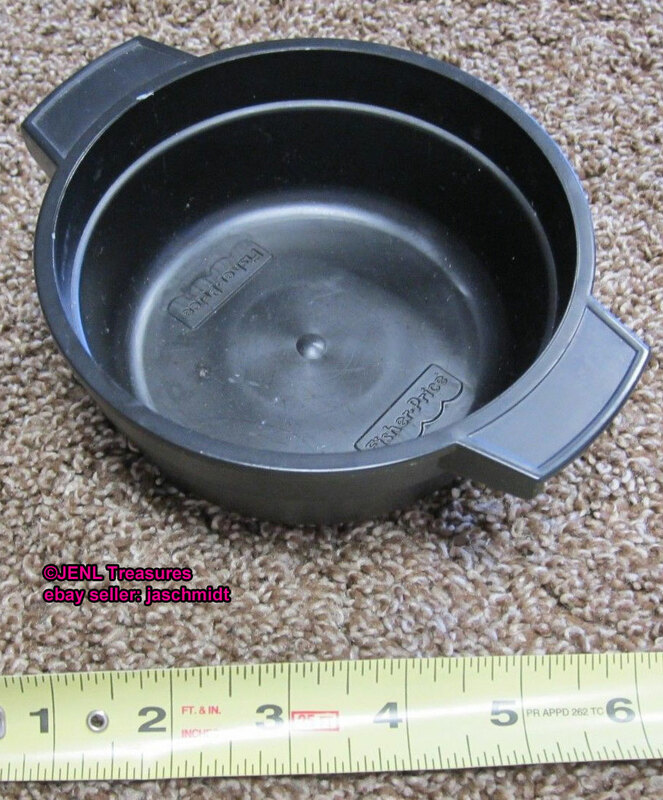 Measures 7-1/2" long (including handle), pan diameter is 5-1/8" diameter, pan is 2-1/2" deep. Description: Clear plastic saucepan with water and green, orange, and yellow floating "seasoning" inside that "boil" when the pan is shaken. 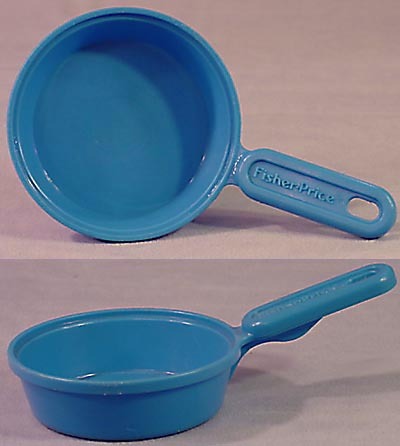 The pan has a white rim around the top and a blue handle with a "Fisher-Price" imprint in top. Measures 8-1/2" long (including handle), 3" deep. Description: Round clear plastic pot with a silver base and a long silver handle. Description: Round clear plastic pot (about 1 to 2 inches deep) with a long red handle on the side. The handle has a hole in the of the end with an apple imprint below the hole . 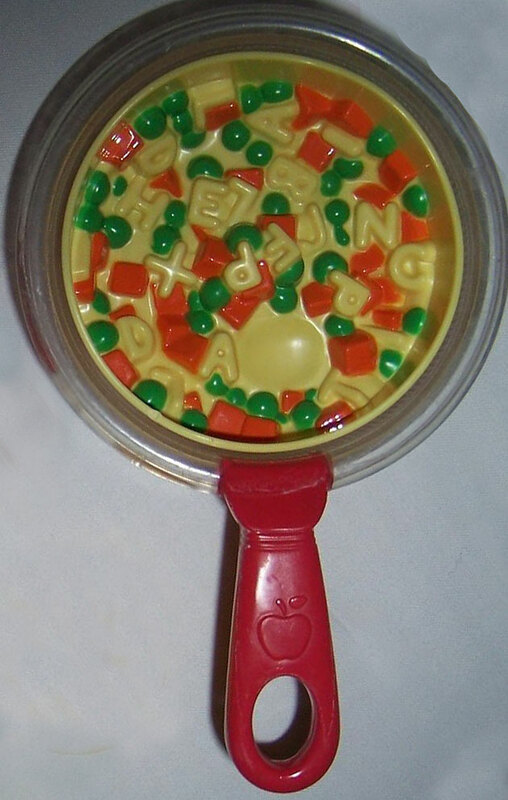 The pot has a round yellow insert inside with yellow, orange, and green alphabet noodles and veggies molded on the bottom. When child "stirs", the yellow "soup" insert in the pot spins...from the side it appears as though alphabet noodles and veggies are spinning and simmering inside. 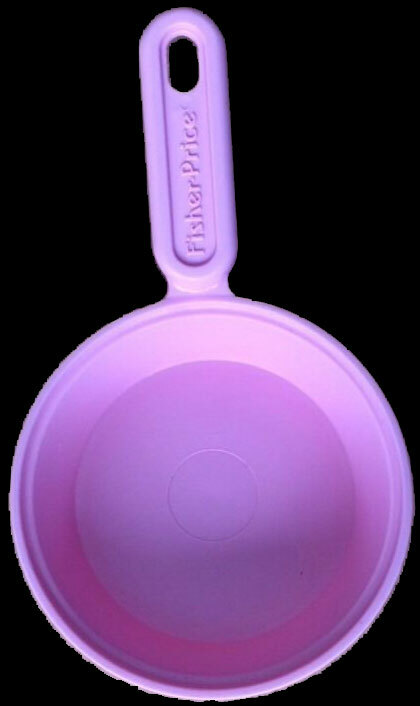 Description: Round pink frying pan with an oval-shaped handle. The handle has a raised oval-shaped edge on the sides with a raised "Fisher-Price" imprint in the center. Measures 3-7/8" diameter, 1-1/8" deep, 2-7/8" long handle. Description: Round pink 1" deep pan (frying pan) with 2 handles, one on each side. The bottom of the pan has 4 small short "legs" on 4 sides. 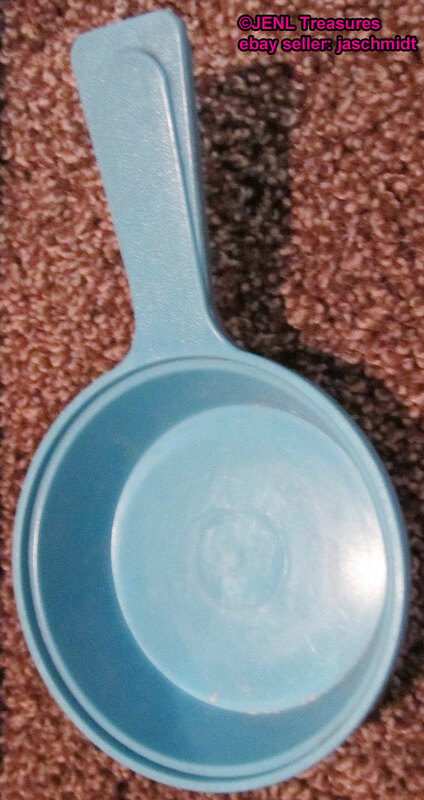 The inside bottom of the pot is marked "Fisher-Price®" twice. Measures 1" tall x 6-3/16" long (handle to handle) x 5" wide --- ???? Description: Large round 2" deep pink cooking pot with 2 handles, one on each side (no design on handles). The bottom of the pot has 4 small short "legs" on 4 sides. The inside bottom of the pot is marked "Fisher-Price®" twice. Bottom of base is marked, "MADE IN U.S.A., ©1989 FISHER-PRICE". Measures 2" tall x 6-3/16" long (handle to handle) x 5" wide. *Same as FPT7458 pot, except handle design. 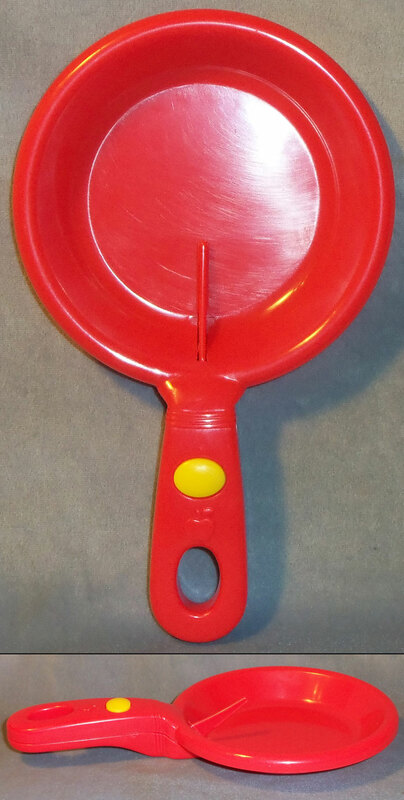 Description: Round red frying pan with a handle that has an oval-shaped handle with a "Fisher-Price" imprint in the center of the handle. There is a hole in the end of the handle. Description: Small round red frying pan with a long handle on the side. There is a hole on the end of the handle, an apple design, and a yellow button on the handle. When the yellow button is pushed, a red flap in the frying pan lifts up. This allows children to flip their pretend pancakes or eggs. Bottom of pan has apple and checkerboard design and back of handle is marked, "©'97 F-P, INC., CHINA". Measures 9-1/8" long (including handle) x 5-1/2" wide pan x 1-1/8" tall. 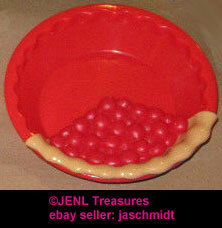 Round red pie pan with molded "scalloped" side edges. Three of the FPT15672 Pie Crust pieces fit within the pan. Bottom of pan is marked, "F-P, INC, CHINA". 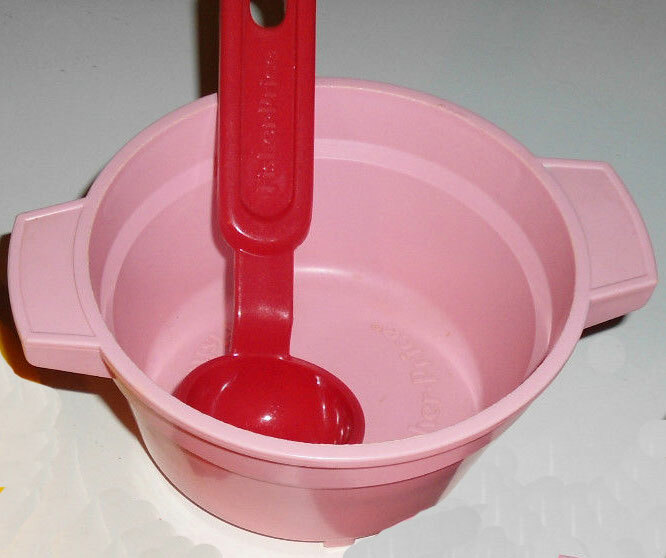 Description: Red pan with a handle on the side and a mirror on the bottom. Description: Large round white 1" deep pan (frying pan) with 2 handles, one on each side. Each handle has a red heart with two blue "leaves" under it. The bottom of the pan has 4 small short "legs" on 4 sides. The inside bottom of the pot is marked "Fisher-Price®" twice. Bottom of base is marked, "MADE IN U.S.A., ©1989 FISHER-PRICE". Measures 1" tall x 6-3/16" long (handle to handle) x 5" wide. *Same as FPT44253 pot, except handle design. Description: Large round white 1" deep pan (frying pan) with 2 handles, one on each side (no design on handles). The bottom of the pot has 4 small short "legs" on 4 sides. The inside bottom of the pot is marked "Fisher-Price®" twice. Bottom of base is marked, "MADE IN U.S.A., ©1989 FISHER-PRICE". Measures 1" tall x 6-3/16" long (handle to handle) x 5" wide. *Same as FPT7459 pot, except handle design. Description: Large round 2" deep white cooking pot with 2 handles, one on each side. Each handle has a red heart with two blue "leaves" under it. The bottom of the pot has 4 small short "legs" on 4 sides. The inside bottom of the pot is marked "Fisher-Price®" twice. Bottom of base is marked, "MADE IN U.S.A., ©1989 FISHER-PRICE". Measures 2" tall x 6-3/16" long (handle to handle) x 5" wide. *Same as FPT10806 pot, except handle design. Description: Large round 2" deep white cooking pot with 2 handles, one on each side (no design on handles). The bottom of the pot has 4 small short "legs" on 4 sides. The inside bottom of the pot is marked "Fisher-Price®" twice. Bottom of base is marked, "MADE IN U.S.A., ©1989 FISHER-PRICE". Measures 2" tall x 6-3/16" long (handle to handle) x 5" wide. *Same as FPT7458 pot, except handle design. Description: Large round 3" deep white cooking pot with 2 handles, one on each side. Each handle has a red heart with two blue "leaves" under it. The bottom of the pot has 4 small short "legs" on 4 sides. The inside bottom of the pot is marked "Fisher-Price®" twice. Bottom of base is marked, "MADE IN U.S.A., ©1989 FISHER-PRICE". Measures 3" tall x 6-3/16" long (handle to handle) x 5" wide. 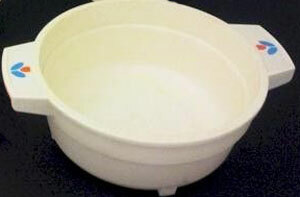 Description: Round white pot that has a small rounded handle on 2 sides. The pot is perfectly flat and round on the bottom, and the sides are straight up. The pot is about 2 inches deep. Description: Small square white skillet with a control panel on the side and a blue handle attached to the side of the control panel. The control panel has a yellow wind-up heat-setting knob. The skillet makes a realistic "sizzling" sound as pretend food "cooks". 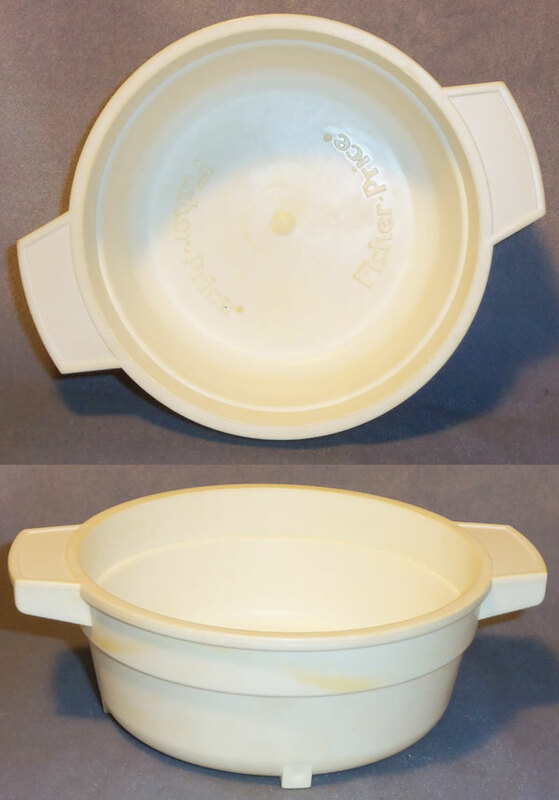 Bottom of the skillet is marked "2115 ©1987 FISHER-PRICE, DIVISION OF THE QUAKER OATS CO." Measures 10-1/2" long, 5-1/4" wide, 2-1/2" high. Description: Small round yellow frying pan with an oval-shaped handle. 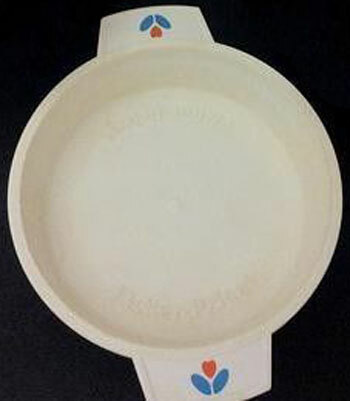 The handle has a raised oval-shaped edge on the sides with a raised "Fisher-Price" imprint in the center. Measures 3-7/8" diameter, 1-1/8" deep, 2-7/8" long handle. Description: Round yellow frying pan with a white handle on one side. The handle has a recessed oval-shape on the handle with a raised "Fisher-Price" imprint in the center. Handle has a blue wheel that makes "sizzling" sound when turned. 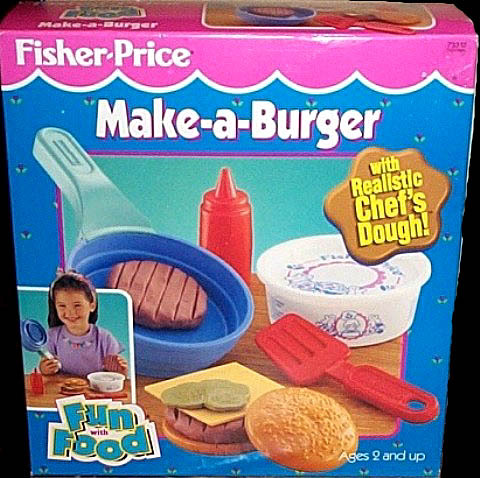 Bottom of pan is marked, "MADE IN U.S.A., 2141, ©1992 FISHER-PRICE". Measures 5" diameter, 1-1/4" deep, 4-3/8" long handle. 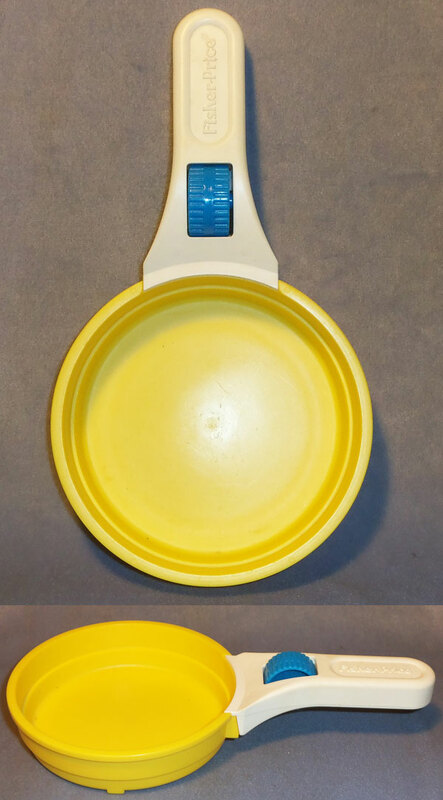 Description: Yellow pan with a rounded handle on the side. The handle has an odd-shaped hole in the center. The pan has a clear plastic cover on the inside bottom that shows multi-colored beads bouncing around under the clear cover. The clear cover has a red edge with a tiny imprint marked "©1989 Fisher-Price.